Thyme is a dependable and useful herb. It’s a warming sort of herb and is often associated with slow-cooked autumnal or wintery dishes or comfort food, but it shouldn’t be typecast. Try it with vine tomatoes. Toss it through green beans or baby carrots. Marinate chicken thighs in lemon thyme and oil and cook on the barbecue (or use thyme and lemon zest). A little thyme added to an omelette with bacon and tomato adds a welcome savoury note. Strew it over a pan of mixed olives and warm them through. Add it to a bread dough and make a savoury loaf to serve with homemade tomato soup. Use it fresh, and judiciously, until you get the hang of how it works with other flavours. If you have masses of thyme growing, pick a good sized bunch on long stems and tie together with string, then use as a brush, dipped in seasoned oil or marinade, to brush over barbecuing meat. 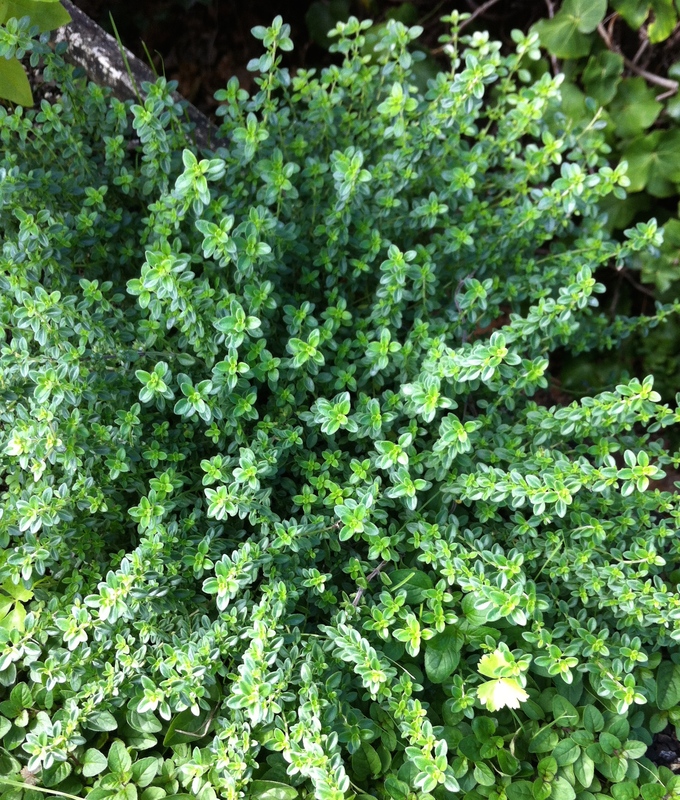 Thyme is another herb which is easy to grow – it just chugs along and as long as you don’t over-pick it or let it get too scraggly, or let its roots get soggy (it prefers a sunny well drained spot and will thrive in dry rocky conditions), it’ll keep on sending up new growth throughout the year. If it does get away on you, give it a good haircut and it’ll soon start sprouting new leaves again. Thyme dries well and is best picked just before it flowers when it is particularly fragrant. Tie it in a bunch and dry somewhere airy out of sunlight. Once it is dry you can remove the tiny leaves from the stems and store them in a jar. A quick rub between the palms will release the oils therein and bring out the gorgeous spicy savoury fragrance.